Supreme Court urged to prevent Women of the Wall from holding monthly Rosh Chodesh service at Western Wall plaza. The Women for the Wall organization, which seeks to preserve Jewish tradition at the Western Wall, on Wednesday filed an urgent petition to the Supreme Court, demanding that it issue an injunction to prevent the Women of the Wall from visiting the Western Wall plaza on Thursday morning, as they do every Rosh Chodesh. "In view of the fact that this is a violation of the verdict of the Court, in a precedent-setting manner, in view of the severe damage to hundreds of worshipers in the last months, a violation that the respondents are well aware of, the Honorable Court is requested to provide an injunction that will prevent the 'Women of the Wall' from carrying their ceremony at the northern Western Wall plaza tomorrow,” the petition states. Women for the Wall said in its petition that "many attempts have been made to permit the rabbi of the Western Wall to take advantage of his legal authority to order the removal of the Women of the Wall, who cause provocations every month." The organization added that "the absurd situation in which a marginal group of 30 women with vested interests constantly harms hundreds of worshipers must be stopped. We hope that this time, in the wake of the blatant disregard by the Women of the Wall of the Supreme Court’s ruling, the law will be exhausted with the lawbreakers and this group will be immediately expelled from the Western Wall plaza." 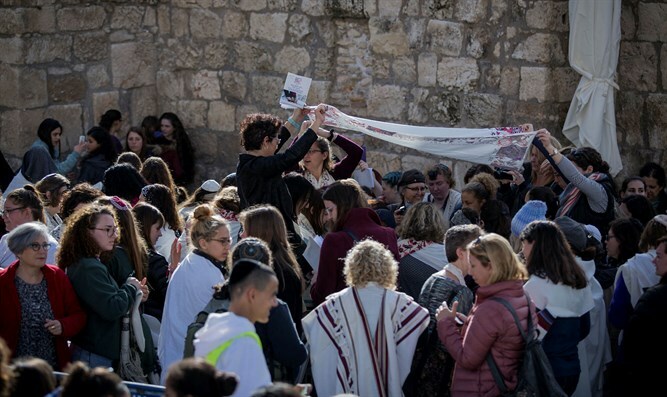 Last week, Attorney General Avichai Mandelblit ordered the Women of the Wall to pray only in the special area designated by the police and the Western Wall Heritage Foundation. The order was given following a petition by the Foundation and the police in response to disturbances which took place on Rosh Chodesh in recent months. If the Women of the Wall disobey the directive, the police have the authority to remove them from the Western Wall, ruled Mandelblit.